Yes total cheese but after someone mentioned that title to me I couldn’t resist. It’s very fitting though. This was Indy’s second SQLSaturday and man it made a new Hope out of me! I have been lucky enough to be part of a lot of SQLSaturdays but this one was my first in the role of organizer. It was a very eye opening experience and I have so much more respect for anyone dedicated/crazy enough to do it. 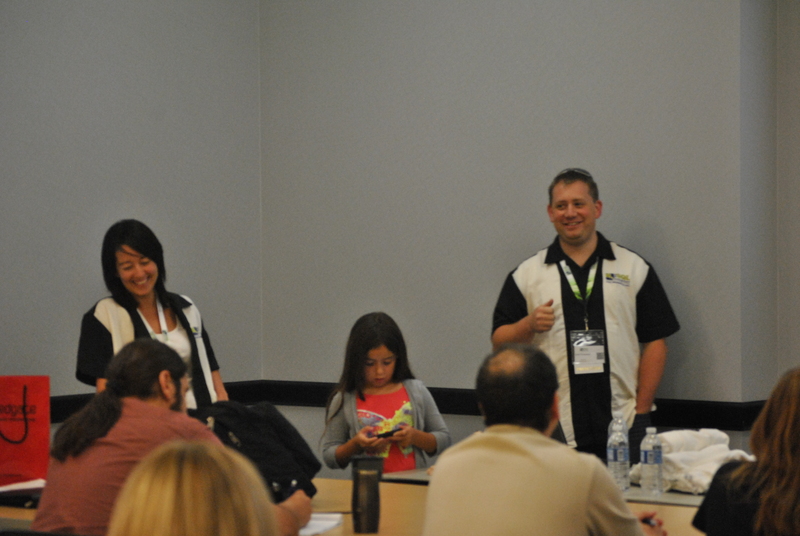 We were lucky enough to get Allen White to come to SQLSaturday and do a precon session. We hosted it at PTI which was nice. It gave us all a chance in the office to get giddy as school girls that Allen was coming to our home base. I was a little worried though when I talked to him in Philly when he only 2 registered attendees. I had nothing to worry about as he ended up selling out with even more folks trying to get into it. It went really well and he did a fantastic job like he always does. As I was in Allen’s session though I started catching tweets about the time zone difference tripping folks up (facepalm). I didn’t even think to warn folks that Indianapolis was in the Eastern time zone. Indiana has these weird lines for timezones and it’s super close to Chicago but we’re on different zones. Ooops! 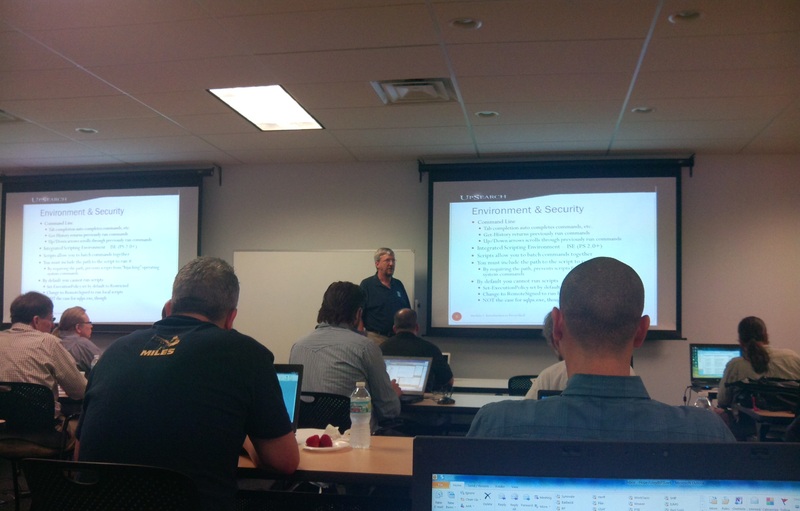 Allen and a full day of PowerShell…what could be better? 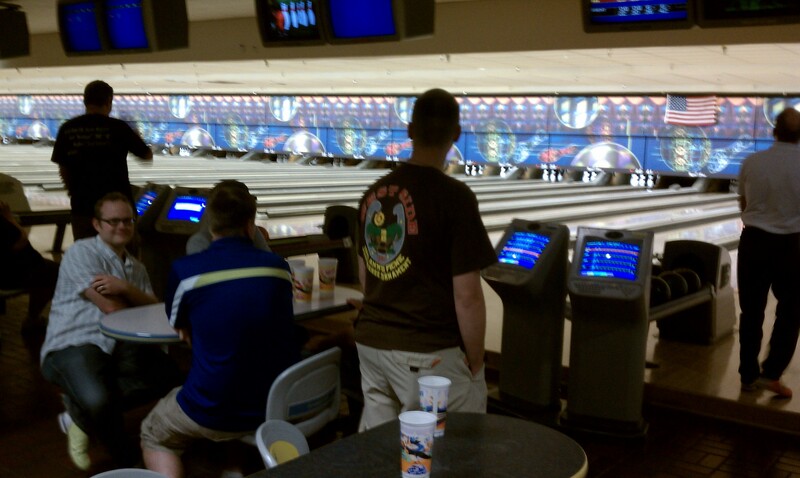 So right after his precon I pack up and head over to Western Bowl on the west side for the speaker dinner. On my way I picked up a nice bottle of scotch for our main organizer, Caroline Bailey. She deserved that and then some! Shortly after I get there and the speakers start to show up. We just had pizzas for dinner and then some bowling fun. I hadn’t bowled forever and am really terrible at it but had a ball. I felt pretty decent with the speaker dinner. It seemed like everyone was having a good time. I get up extra early to get a quick workout in before heading over to the venue. I had to navigate there like the pilgrims did as my phone decided to take a morning off from allowing me to get internet access. I had to call my husband and ask him how to get to University of Indianapolis. I get there and I was not prepared for the pandemonium. Everything is going ok but with all the registrations going on with that many people in general, tends to give you the chaos vibes. I try to get my bearings and then I begin to hear about issues with the hotel. We had storms on Friday and apparently that caused the hotel not to have elevator service and hot water! Lovely no?! I also hear how quality of it was not great. My shoulders droop and I begin a long day of just feeling terrible, mostly about this. The hot water and elevators were an act of god but quality of the hotel was on us. I wanted to take care of all my speakers in my hometown and I felt like a giant failure. Tried to swallow that issue and get through the rest of the day. We then hear about issues with WiFi. I begin trying to hunt down some IT folks to figure out what is going on without much luck. We had some successes but WiFi was pretty much a no go and I learned to live with it. From there I then hear about how someone is having issues with projector…of course they are! I really begin to feel a bit defeated but carried on to the first session of the day. I grab my stack of feedback sheets and head down to assist in Julie Smith’s (blog|twitter) “Data Quality Services – Finally!” session. Just what I needed to help get my mind off all the issues, Julie’s great sense of humor and really great info. This works for a bit and I am distracted wondering what type of a hat a data steward should have, because with a name like that you really must have a hat. Then her session is over and she did a great job and I start collecting feedback. I realize after that when I take the feedback up to the front area for prize drawing that I didn’t exactly tell hardly anyone to put their name on the sheet and it didn’t have a place for it. Lovely…organizer reality comes crashing back to me. I then skip next session and try to get my bearings and figure out who needs help. I probably was in the way more than I helped but that’s ok. I talk with some of the speakers and do a lot of apologizing for hotel. They were all pretty nice about it and tried not to make me feel bad, it didn’t work but was nice of them regardless. I then catch up with my husband and daughter who came to help me out. My hubby was going to take pictures of the event and my daughter was there so I could show her what mommy does when I’m out of town. 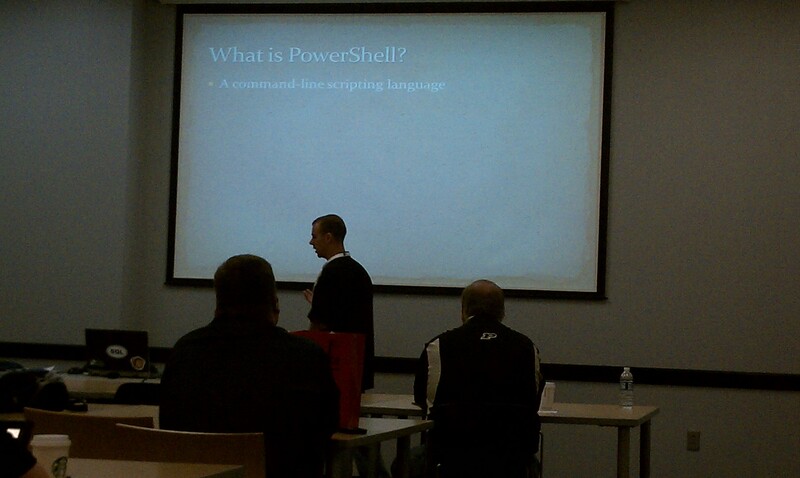 Ok then on to Shaun Watt’s (twitter) “PowerShell and PerfMon…Come on!” session. We decided awhile back to make sure first time speakers had a friendly face in the audience to assist if they needed it. I was that friendly face for his session. This was his first SQLSaturday and had only given this session just the prior week for practice to the local user group. I was glad to do this as was around the day of Christina Leo’s (blog|twitter) experience on her first time session. Nicholas Cain’s (blog|twitter) blog post on it stuck with me and took his suggestion. Shaun did a great job on his session so didn’t need me but I felt better being there. He does really well for being new to technical speaking. Shaun doing his second live presentation ever! Then on to the WIT lunch panel. I always love going to these and honored when asked to sit in on the panels. My sales partner in crime, Kandy Vicini, was the moderator. 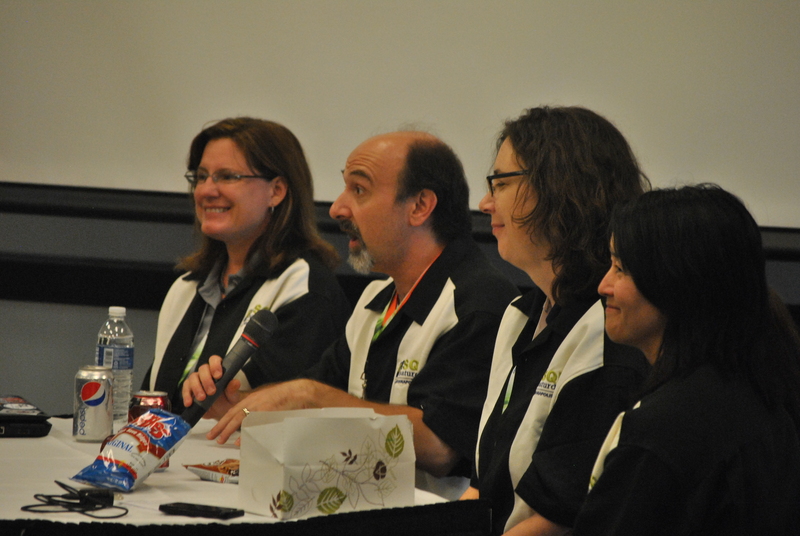 On the panel I sat with Wendy Pastrick (blog|twitter), Eddie Wuerch (blog|twitter), Julie Smith, and my daughter sat with me. She is severely shy so knew she wouldn’t speak but it was nice having her with me. She is my own little WIT ideas in action and I at least exposed her to a technical world. Everything went well and Kandy did a great job other than the failure of mispronouncing and not knowing who Roger Waters is of Pink Floyd. She came armed with statistics and everything! I was very impressed with the job she did as moderator (and no not still sucking up after Atlanta incident). The discussion turned more into one on community than women but that was OK. It was still great conversation and a lot of information was shared with audience. We all look amused except for Eddie. 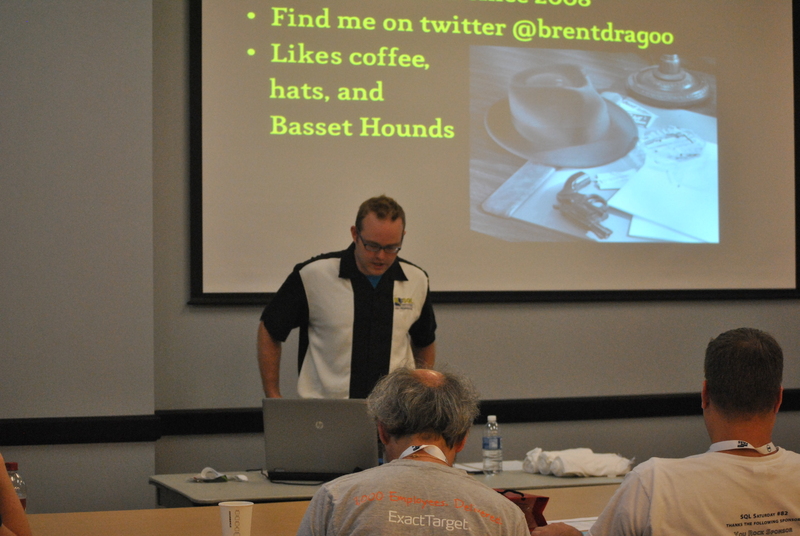 Up next was Brent Dragoo’s (twitter) session, “Database Crime Scene Investigation”. I was sooo looking forward to this as it was his first time doing a technical presentation. I met and talked with him at last year’s PASS Summit and started putting that bug in his ear ever since then to speak. He is one who is very passionate about the SQL community, well spoken, and technically savvy so I knew he would be great. And he was and I was able to say I paid a little bit of that good karma forward for those who help nudge me along down this wonderful community path. Even though he was an unknown speaker, his topic packed the room! He did a good job and the symbolism he used was really great. Brent and his first presentation ever! Next I caught my bearings and chatted with Ted Krueger (blog|twitter) a bit on our session that was up last session of the day. 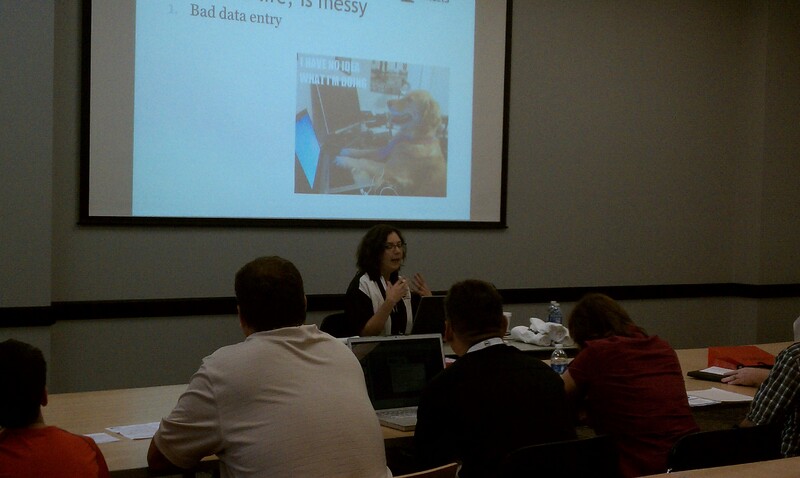 We had a speaker who unfortunately had a car wreck and was unable to make it to SQLSaturday. I found this out on Thursday. I had been toying with the idea of doing a professional development session for awhile on consulting. Ted, who is inhuman for the amount of time he gives to helping folks in the community, agreed to help me with a last minute panel discussion. So we quickly whipped up “Consulting – The Good, The Bad, The Ugly”. For being such a rushed effort, I thought the discussion was really good and we got good feedback. I can’t wait to do that one again and refine it a bit. I really had a blast during that one! We also pulled in Josh Fennessy (blog|twitter) to the session and Aarow Lowe (blog|twitter) provided a lot of great feedback as well. Big props to Ted! You are da man! And thank you Josh and Aaron too! See…this session was a riot! Ok so then on to the awards ceremony. That was a bit chaotic as well but worked out. Kyle did well presenting closing remarks. Eddie also stepped in as well to fill some time and provided a lot of comic relief. Somehow he became the guy who you had to take a picture with when you won a prize. By this time I started to become distracted with visions of much needed beers in my future. One thing that I noticed though was that we did not have to re-call any names during the huge amount of prize drawings! I thought that was really great and says a lot for the Indy tech community. Either they are dedicated enough to learning to stay all day or really, really wanted that LANTech iPad. Then on to the after party. We were worried about funds so planned a very casual gathering for folks at the hotel restaurant. The appetizers were good but being there in the blegh hotel just felt like salt in my wounds. I had some good conversation with folks and many kept trying to build me back up. Many times in the past when I have talked to organizers, they are very apologetic and I’m often confused wondering why. I completely know how they feel now! I kept saying “I’m sorry” over and over and folks looked at me funny and how great it was from their perspective. They don’t feel the full weight of every little thing that went wrong. We then moved on to a Mexican restaurant for some REAL food. (See I learned my lesson from SQLSaturday Atlanta – never try to make a meal out of appetizers when drinking). I think I pulled a muscle laughing so hard at dinner and mas cerveza helped me out of my down in the dumps demeanor a bit. Some even more brave souls trekked onward to the lovely karaoke dive bar where we did have some SQL Karaoke. My record of not singing is still intact but they put in a good effort to try to convince me again. I had a great time with everyone who made it. And again I am sorry for the bumps but as you can see I learned my lesson. <in my best Scarlett O’Hara> And as god as my witness, speaker hotel will not be janky ever again! 1. The internet is a damn liar! Well except for this blog post of course, but I will NEVER EVER EVER trust only website photos for quality of hotel. Always have manual inspection of hotel or only use ones people have stayed in before. 2. Always have a run through of sessions with the room proctors prior to the first session. We didn’t have the process down for until after first session. At least have a quick huddle up with everyone to let them know of the process. The absolute worst thing happened here due to this, at least one speaker I know didn’t get feedback. Feedback to a speaker is like gold and should be treated that way. 3. Start early to get sponsors. It is great that there are more and more SQLSaturdays for the community but organizers have to work harder and harder for sponsor dollars. 5. Make sure to consider topic as well as speaker for the projected audience size. We had some rooms that were larger than others. We miscalculated on some of the session crowds, BIG TIME! I apologize to those who were sardines in some sessions. An idea I had, if you are unsure, ask speakers for feedback on audiences for presentations. There’s no guarantee with that still but better than a shot in the dark. Also another idea I have from this is to have room proctors to get counts for future reference. 6. Force help more on obsessed organizers. Caroline Bailey is on our marketing and event planning team at PTI. She plans a damn good event and did so again with our SQLSaturday. Us in the SQL community (myself and Kyle) totally took advantage of her willingness to help and skill at event planning. Make sure you don’t let passionate souls bear the more weight than they should. 7. Again make sure since Indiana is weird timezone wise to remind folks that Indy is Eastern timezone. 8. Get with the venue folks many times in advanced to check on WiFi status. Stress importance of WiFi for technical audience and threaten life if necessary! 9. May have been nice to have headsets to communicate with organizers. Or at least some way to communicate via cell phones instantly. There were several times I shrugged my shoulders to questions when could have/should have fired it off to Caroline or other committee members. Oh the goofiness I could create wearing a headset too! 10. Make sure to have plan B, C, and D in place for speaker fill in for cancellations. Cancellations seem to be inevitable and need to make sure to have your backup plans in place. Thank you so much to Wendy and Joe for doing two sessions. And big thanks to Ted again for helping out super last minute. Next postScratching an Itch and Great Training! Hope, thank you so much for hosting a great event. The problems at the hotel were not a big deal! And I SO Completely agree that to be a good data steward, proper head wear is essential! Best! I’ll echo Julie’s sentiments about the hotel, definitely not your fault and nothing to beat yourself up about. I had a great time, and I’ve been to other SQL Sat’s that had even more problems and turned out fine! One trick re: communication I picked up on a cruise: buy cheap walkie talkies at Radio Shack/Target/Walmart. You can get a pack of 4 for <$20 or even $10. Check with anyone you know who's been on a cruise, you may be able to borrow theirs. They are multi-channel and have enough coverage for a single-building venue like yours, and most have a headphone jack if not a full headset. And just to be nit-picky (hey, you can't do it all yourself!) Episode 2 was Attack of the Clones. 😉 Episode 4 was A New Hope. Thanks guys! Appreciate you guys saying that. Rob that is a good idea…definitely going to do that next year. And yep on the Star Wars…but I couldn’t wait till episode 4 to get all this off my chest 🙂 So glad you guys made it up to speak…absolutely loved having both you and Julie!